Wrapping up and looking ahead. In 2011, we got our finances organized. I ran two 10k races (not to mention over 260 miles!!! ), and spoke publicly twice for work. I hereby declare the goals of 2011 COMPLETE! This was a grand year of grandness. A trip to London and Paris. Turning 30. Adopting Ollie. Learning to run. Attending SXSW. Other people's weddings. Our own wedding. A honeymoon, Camp Mighty, trips to DC and Madison. We're ending this year in Cape May, NJ. My family used to come here every summer when I was a kid and when Chris and I realized we needed to hole up and be thoughtful this weekend, it seemed like a good solution. So that's where we are. We are wandering and lunching and sleeping in. We're reading books and writing resolutions and talking about our values. Because the opportunities we will encounter in 2012 will challenge us... and we want to make sure we have things straight before another year of craziness ensues. 1. Submit a short story to be published. 3. Learn to prepare 3 dinner recipes by heart. 1. Keep in touch with family. 2. Set small goals for myself at work so I can track how I'm doing. 3. Socialize outside of work. Happy New Year's, everyone. May you be stretching and strengthening and preparing for another year of possibility. 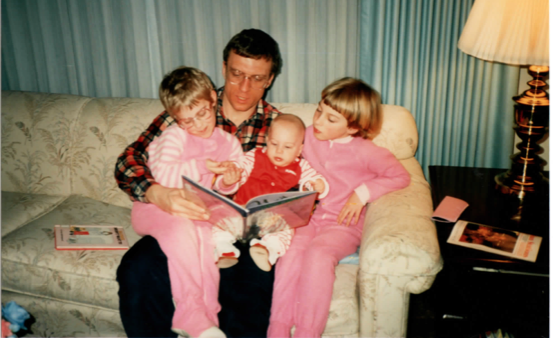 Reading with Dad in 1988. That's me with the bowl cut. The other day someone asked me what I purely love. What do I love so much that it remains untainted by anything- responsibility, obligation, whatever. That's a tough question. But after thinking about it for a few minutes, I said that I purely love reading. I don't feel an obligation to read anything I'm not in the mood for (and if I start reading something and am not into it, I'll drop it immediately). In this one area of my life, I go with the flow. I go with what I love. Much more to say about this another time, but here are the final book reviews of the year. And if you scroll down a bit farther, you'll see the list of books I read in 2011. Happy reading, you rabbits! I wrote a little about this novel last month. It's pretty epic. It traced the stories of families from the 1600s all the way up to present-day. I'm not going to say the writing was incredible because it wasn't. But you know how you read some things that aren't great in terms of craft, but in terms of story and learning? This was one of those books. I'm dying to read his novels on London and Russia. I mean, seriously. What better way to learn the history of a city? This book was really bizarre. It's the story of a woman who can only remember up to 24 hours; when she goes to sleep at night, she forgets everything and has to start all over again the next day. Given the trickiness of pulling off any sort of meaningful story with these restrictions, the author did a decent job. The ending was pretty scary - and surprising for me, but I'm pretty naive. I'd recommend! Again, I recently wrote about this one too. Audrey Niffenegger, dude. Hardest name in the world to pronounce, but totally someone I'd love to meet. I remember when I was at the Iowa workshop last summer, someone mentioned that she'd been there a few years back, right in the middle of writing The Time Traveler's Wife. She was getting ripped apart in some of the classes and was feeling really down on herself, but I guess some classmates bucked her up. She was supposed to stay the whole summer, but ended up leaving partway through and writing full-time to finish the book. And we all know how great that turned out! This little anecdote gives me hope for my book one day. Firstly, that I write it. Secondly, that I will have a network of people who believe in me. Cause I literally can't wait to see what she writes about next. Recently, it was Small Business Saturday and Am-Ex was giving people a $25 credit on their statement if you spent $25 at a small biz. Hello, independent bookstore down the street! I picked up this book of short stories because I was in the mood and it was a mixed bag. I don't remember many of the stories (something that always gives me pause...), but I was intrigued by the theme of the book. They were all stories about relationships that could have happened, but didn't for one reason or another. I liked it more towards the end. OK! This is way out of order. I read this in June and just realized it never made it into a book review. That's a problem because this book was GOOD. I excerpted it while I was reading and bought it somewhere super-cheap recently to make sure it was part of my collection. It's a modern-day story about a couple who has two young kids. They're having normal, modern-day issues. He works in venture capital. She works and cares for the kids. They don't have enough alone time. There are some weird lies that get told for good reasons. And it's the downfall of their marriage, as well as a rebuild. Details are hazy because I read it so long ago, but I remember REALLY liking it. You might too. We saw Jeffrey Eugenides at the New Yorker festival this year. He was on a writer's panel and man, was he likeable. Very straightforward but funny, honest and a little quiet. He joked that it's awkward for him when one of his books comes out because he goes to dinner parties soon after and everyone asks when the NEXT one is happening. "Don't they know it takes me 9 years between each book?!" he laughed. I think the biggest reason I like Middlesex is because it's about so many topics that I know nothing about. Detroit, Greece, immigration and, obviously, hermaphrodite-ism. I literally feel like I learn things by reading this book. And though I'm positive I didn't do this while reading for the first time, I had my iPhone handy to look things up as I encountered interesting stuff this time around. The story is about a hermaphrodite who shares his story by reaching back into the past and tracing the funky things that happened with inter-marriage, all resulting in a tweaked gene. I like the idea of reading stories about several generations. I had the same feeling with Rutherford's New York. There's something to be said for puzzling out how characters are why they are based on who they came from. I super-recommend. It's a great read. At Camp Mighty, we each had to name 5 things we wanted to complete from our life lists in the following year. One of Chris' was to buy my Mom a sack of gifts. My Mom is very generous. She travels a lot for work and takes a lot of time throughout the year finding little things she thinks we'd like, saving them in secret hiding places, and finally gifting them on Christmas morning. Chris first spent Christmas with my family in 2009; my Mom treated him as another one of us that year, gifting him generously. At Camp Mighty, Chris said how touched he had been by her generosity. He wanted to find a way to make her feel special too. And thus, the "sack of gifts" idea was born. He asked our Camp Mighty team to help him with inspiration. We wrote out a little bio of who she is, what she likes, what she does in life. Our Mighty Team came through with lots of ideas... and some of them even sent gifts to contribute to the present. More Flickr pix here... and need I say it? I totally married the best guy. Being RIDICULOUS with my sibs in 2010. I had a hard time feeling Christmasy in Brooklyn. Originally we planned to come up to my parents' on Christmas Eve morning, but then I broke down on Thursday night. It's just not Christmas without my family around, without Mom's cookies and the Chex Mix we ceremoniously bake. It's not Christmas without wearing fleece jackets in the house because it's so cold. And it's not Christmas holiday music as a background. So we came up to Yorktown last night. I'm sure there will be a time when I will need to shift my definition of what Christmas is, or, more specifically, where Christmas must be. 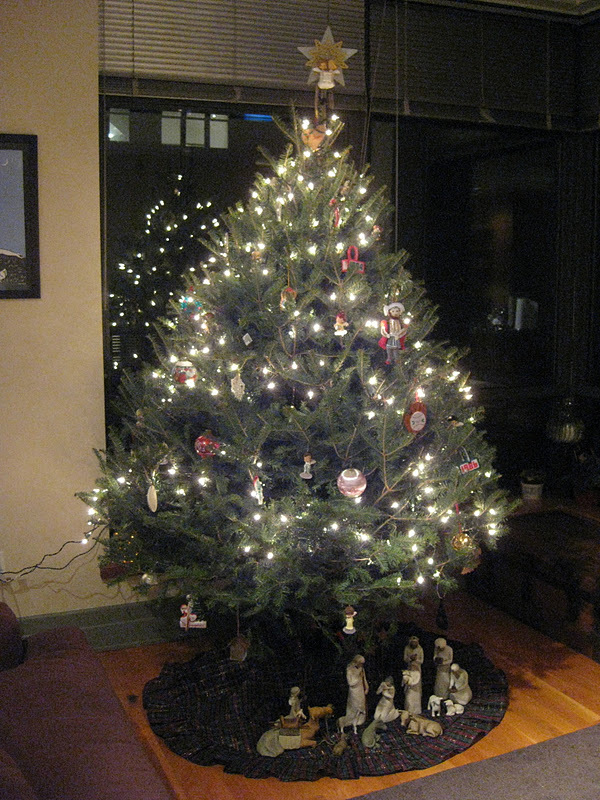 But for now, I am content to settle into this chilly house and count this tradition once more at home. Merry Christmas to you and yours. Enjoy the day... and the hugs. All those Christmas hugs. "Here we are, as in olden days..."
The saddest version of "Have yourself a merry little Christmas" was sung by Bert in Christmas Eve on Sesame Street. We used to watch this every year and for some reason this song always made me super-sad. Maybe that's because Bert is kind of sad. You get the feeling he doesn't do so well socially. He's the Mitchell to Modern Family's Cam. A little uptight, a little nervous, but underneath, a hopeful little heart. 2007 was the year that I moved home from Paris and was very, very sad. I was still sad at Christmas and I remember driving around my home town alone one night, looking at Christmas lights and singing that song to myself as I drove. Hearing my little voice singing that song in the way Bert does... well, I drove around with tears rolling down my cheeks. I made MYSELF cry, it was that sad. I remember the tough Christmas that winter and I'm so grateful I made it out ok. If you're having a tough Christmas yourself this year, hang in there. It's amazing how things can turn around. It was 2005; February, I think. I'd left Clermont-Ferrand the previous May and was dying to see friends in France, so my mom and I planned a trip. We stayed in a friend's friend's apartment while he was on vacation. The apartment had a kitten, a billion bookshelves, and a tiny kitchen where we cooked dinner one night for Erica, Angelique and Jean-Yves. I was pretty jet-lagged that trip. No biggie, though. I had a book I was obsessed with to keep me company into the wee hours of the morning. Middlesex was published in '02, but I didn't find it until '05. 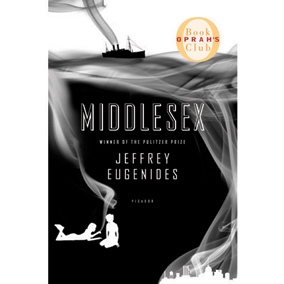 By that point, Jeffrey Eugenides had won the Pulitzer but hadn't yet been featured on Oprah's book club. I knew it was a big deal, but the truth is that all that meta info about a book-- the prizes, the quotes from other authors, the marketing of it-- fades away. Because at the end of the day? You either sink into a story or you don't. 1. I forget a lot of details about books I've read. Ok, not just details- plot lines too. 2. This book is DAAAAAMN good. Rereading is the best thing ever. It's like hanging out with an old friend, like remembering how much funnier someone is in person or how thoughtful and likeable they are in conversation. You know these things about them, but every once in a while it's refreshing to be in the same place again, paving over old memories with new ones. Last night I finished a travel guide for Washington, DC. You can find it under "Travel Guide" in the top nav or you can click this little link right here. I'm hoping to do a bunch more of these in the new year. Once my friend Priya told me that she used mine for Seattle and Portland and it made my freaking day. Plus, who doesn't like a starting point when they explore a new place? During our last trip to DC, we were finally able to see my brother's band play. They're Orchard Wall and they're pretty great... go to their page and listen to "Mother's Yard." It's a song Steve wrote about/for me and he burned it on a CD that we listened to on the honeymoon road trip and I bawled through the Redwoods. At Camp Mighty we had to name 5 things we want to accomplish in the next year and one of mine is to sing a song with Steve's band. So... stay tuned for a star performance in the new year! Christmas, Dayquil and the like. Ornament from 1984, broken by cats. This morning I woke up with a sore throat. So sore, in fact, that I couldn't really talk above a whisper. This was... undesired. We had STUFF to do today. Three holiday parties tonight and a date with my parents to see the Rockefeller tree and get dinner. Alas, it is all canceled. On top of that, I don't feel very Christmasy this year. Christmas is different when you're an adult. We won't have much time off and it's been such a big year for us with gifts (what with the wedding...), I don't even feel like I need things this year. Since I bought many of our gifts for family online, I haven't gotten the full dose of commercial Christmas. I baked dozens of cookies for the doormen this week, but it still didn't feel the same. I'm not quite sure how to fix it. What do I really want for Christmas? Someone to sew the holes in the pockets of my coat so my keys don't keep dropping into the lining. Someone to put the last bookshelf in our living room together. Another week of vacation. Updates from friends I haven't heard from in a while. My blog ported from Blogspot to Wordpress. That's really the truth. I don't need a ton of stuff. There are two weeks left in 2011. Two weeks from tonight, we'll be getting ready for a new year, a new dawn. What are you dreaming about for next year? What have you already put in place? What's going to grow? What needs to be slashed and burned from your life? In the quiet days that stand between now and then, I'm looking forward to slowing down. Even though we'll be working most of the next two weeks, the days will be a bit quieter, a bit lagged. I need to take some giant deep breaths during this time because 2012 is already gearing up to be an intense storm. I feel at half-tank just thinking about it and I'm trying to get creative about how to refuel. I'm circling in on my theme for 2012. I considered "More sleep in '12!" and "Summer in the south of France '12!" but I'll probably settle for something more practical. Like "Less proactive in '12!" I sure do get myself wrapped up in 1.7 million things per week and I'd like to step back and be a little more picky about the opportunities I pursue. I have wedding pictures. (Statistics show that 47% of you just drooled on your keyboards.) I don't know how best to share them. Dumping them in a Flickr album seems... rude. And a bit too open-door. Dropping them all on Facebook seems... like a lot of required tagging. I haven't figured it out yet. But they're coming! 47% of you will be super-pumped because they are awesome and you are probably in some of them and even though I feel awkward in some of them, I am trying to get over it and watch a little more ANTM to embrace my inner model. Speaking of, I had a professional headshot done recently. I KNOW. Amber (of Brooklyn, of Camp Mighty, of the Internets) took it and I'm just waiting to get the finalized version. Then I'll stick that up there where the photo of me with no make-up currently sits. Little by little, peeps. We're going to clean this space up for next year. I have some BIG plans in the works... plans that more than 47% of you are going to super-drool over. Brian, exec producer on Oprah, talks with Maggie Mason. I've previously written about 5 goals. My friend Sima and I send each other 5 goals each morning that we aim to accomplish by the evening. These goals are small and achievable, and a mix of personal and professional tasks. We've been doing this for over a year and a half and it gives a lovely rhythm to my morning. Since Camp Mighty, I've added a new component to the 5 goals. I now list out an intention for each day. When an executive producer from the Oprah show spoke at Camp Mighty, he talked about the importance of intention. Each show they produced had a specific intention and I realized how helpful it can be for a day. So along with my 5 daily goals, I also write something I intend for the day, based on what I have on my calendar and what I anticipate encountering on each given day. Push for specific solutions for problems I encounter today. Be a bright spot in the day of those I come into contact with. Make small, but noticeable progress. Need a structure for your day? Try it. It's great to have one overarching theme to the kind of day you plan on having. And it always makes me feel better, even on really overwhelming days. The first time I finished Her Fearful Symmetry, it was past midnight the night before Chris was leaving for a trip to Wisconsin. I stayed up really late to finish because I couldn't bear the thought of finishing a ghost story without him in the apartment and I couldn't bear the thought of NOT finishing the book until he returned. The second time I finished Her Fearful Symmetry, it was also late at night, but this time we were in Wisconsin. We were laying on the airbed in Chris' Dad's basement and the still-lit Christmas tree cast a little light towards the dark corners near the stairs. I had to pee, but put it off for 30 pages because I was scared to walk to the bathroom alone. And when I finally finished the last page and went to the bathroom, I did it quick, like when you're a kid, like when you bolt back towards your bed, a surge of adrenaline and fear chomping at your heels the whole way. What struck me most this time around was how this is not just a ghost story. Like The Time Traveler's Wife, this is a love story. It's the story of sister love, parent love and partner love. I lay there, unable to sleep, feeling uber-gushy towards Chris. I worried about who would die first. The love from that love story had just soaked right in and I was left as one is at the end of a truly good story: staggering and struggling at the beauty and complexity of life. This is my first re-read for this semester and what I'm realizing is that these second encounters are as much about the circumstances surrounding the memory of reading, as they are about the book itself. I think I'll document the experience of the re-read with posts like this, typed out stories about the stories themselves. Hello. How have you been? Me? Fine. Busy. Taking care of BIZ. You know, the work business. And the business of two cats and a husband. I didn't mean to drop a "do-over" semester on you all and then disappear, but there was a soup cook-off and a photo shoot to get a professional head-shot done and a holiday party with friends. 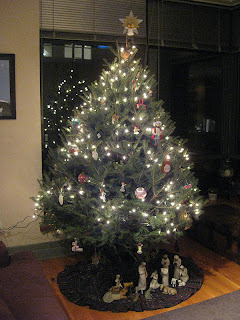 And a tree purchase and a steak dinner and a bowling party where I got my tarot cards read and it was SPOOKY. And two cats who broke ornaments and some long, long days at work. I have so many pictures of all these events, but the cord to upload them seems very far away right about now and I'm already sleepy even though it's 9:37pm. SO. Another day. But I just wanted to check in here and say, hey. Hey, hello and hi. 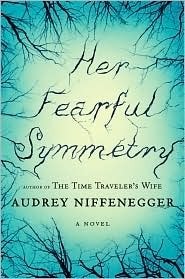 PS I started re-reading Her Fearful Symmetry and it's so much scarier than last time because I know what happens. Last time I tried to avoid reading it too quickly because I wanted to savor every page and this time I can only read 10 pages at a time because I want to avoid the dark ending. Yikes! The perils of a re-read. PPS We are headed to Wisconsin tomorrow afternoon for a good old Kenosha Christmas. It's our annual tradition of a pre-Christmas with Chris' family and I'm looking forward to catching up with the Wisconsinites and high fiving about the Packers. Those Packers! So good again this year.